...and lunch is on us! READ 1d or 2d barcodes? Most quality problems start at the very beginning of a product�s journey on the production line. Getting it wrong there can have disastrous consequences. 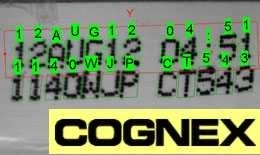 However, with Cognex machine vision systems in place, you can instantly improve your production processes to ensure you Make It Right every time. During this presentation our experts will show you how you can detect issues on your line BEFORE they become problems for your customers! Join us on March 13th -We want to help you Make it Right and Read it Right - every time! Learn how to use OCRMax�, the new Optical Character Recognition (OCR) tool from Cognex, and achieve the highest read rates possible in virtually any production environment using In-Sight� or VisionPro� software. OCRMax overcomes the limitations of other OCR technologies. This tool takes on character variations, text skew, proportional fonts and variable string lengths, and much more � making it the most robust character recognition tool in the industry. It's easy to set up and use with minimal training. From potato chip bags to video tape, converting a flexible material into a sellable product is a complex process that often requires special machines built to unique specifications. While there are common mechanical and control designs for each application, attaining custom machinery at attractive margins becomes increasingly difficult. 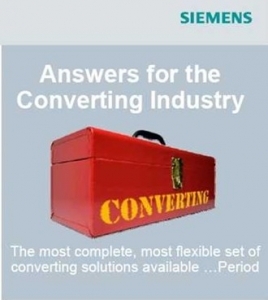 At Siemens, our industry specialists combine application, motion and automation knowledge to provide a complete solution to our customers that is cost-effective, yet still provides accelerated deliveries and performs to expectations. What�s more, because Siemens automation programming tools are open, machine builders can take full advantage of the integrated diagnostics, maintenance and service functions unique to Totally Integrated Automation. Introducing the Lector620 image-based bar code reader, part of the ICR family of automatic identification solutions. 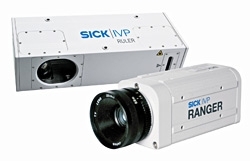 This compact and industrial imager reads all popular 1D, 2D Data Matrix codes and PDF 417. It can read stationary and fast moving codes (up to 900 fpm), and can output more than 20 2D codes a second. It reliably reads codes on varying printed materials: from 1D inkjet printed on corrugated boxes, to laser etched 2D codes on PCBs, direct marked codes on metal, as well as codes printed on plastic, glass, and paper, etc. During automotive production, different sedans with differing types of equipment are manufactured in a large automotive plant. The plant needed to allow car bodies to easily pass through entry points while the personnel protection was constantly activated. As a solution, the C4000 Fusion safety light curtain from SICK could detect a large number of different skid beam patterns without additional sensors or indicators while differentiating them from someone's legs walking past, for example. The solution saved space and costs while maintaining a high level of availability and avoiding downtime. The mini Twin safety light curtain is named for its miniature size and twin stick principle. With a cross section of 15mm x 32mm, it is by far the smallest safety light curtain on the market. Combined with the broad range of lengths available, the miniTwin can be more closely matched to the size of the area needing protection. Its award-winning twin stick design combines the sender and receiver into one stick, simplifying ordering and reducing inventory costs. With end-to-end coverage, dead zones are no longer an issue in cascade applications. Two or three sets of miniTwin sticks can be cascaded together and wedged right next to each other without loss of resolution. This allows the light curtains to be mounted closer to the machine, thereby increasing productivity. Watch our video to see the latest solutions to optimize your packaging processes, including machine vision, safety and bar code. Animatics is the pioneer and recognized leader of integrated motion control. The SmartMotor� is an integrated motor by Animatics. Designed by the industry leader, the Smart Motor is highly integrated control and is just one of the innovative motion control products by Animatics. Our line of integrated motion control products feature multi-axis coordinated motion, network bus capabilities of RS232, RS485, DeviceNet� and ProfiBus, and highly flexible on-board and expandable I/O. Any SmartMotor can control an entire machine. 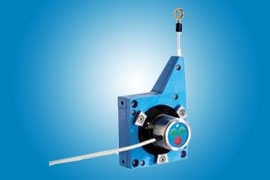 Frame sizes range from standard NEMA 17 to NEMA 42 with speeds in excess of 10,000 RPM. The BCG EcoLine of wire draw encoders is ideal for precise length/distance measurement applications. It is an economical solution that includes a scalable analog output (4-20mA or 0-10V) that easily interfaces with control systems. With an easy-to-use pushbutton function, users can easily configure the unit for different lengths � simplifying setup and saving time. The BCG is enclosed in a thin, compact housing, making it ideal for applications with limited installation space. The BCG offers two versions of standalone MRA-F Wire Draw Mechanisms that, when combined with SICK�s existing encoder portfolio, give users advanced customization capabilities that far surpass any competitive products. The BCG provides precise measurements for automated guided vehicles, storage and conveying systems, presses, handling systems, medical applications and many other industries. Ranger - The fastest camera in the world for three dimensional shape measurement! The Ranger camera measures 3D features at unmatched speed producing a complete data set of the object measured. Providing a 3rd dimension adds height and shape measurement data, which can be critical when correctly classifying an object. Ranger is the key component in many market leading in-line inspection machines used in the Electronic, Semicon, Wood, Robot Vision, Plastic, Rubber and Food industries. The Ranger acquires up to 35,000 profiles per second, each containing up to 1536 high quality 3D coordinates. This is more than 45 million 3D points per second! The complete 3D calculation is done inside the camera and the ready-to-use 3D coordinates are sent directly to a standard PC via CameraLink or Gigabit Ethernet. This eliminates the need for expensive post processors.